It's Red Dot Auction Season! 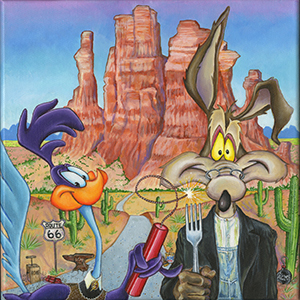 Costa Mesa, Ca: Orange County business, WoodSnap, is joining with Chuck Jones Center for Creativity this year to present the eighth annual Red Dot Auction, the Center’s spring fundraiser. Twenty-five of their photographers will, along with WoodSnap, donate their work printed on the company’s signature birch wood, to create the WoodSnap section at the Red Dot Auction. “WoodSnap was built on inspiring creative minds to print their favorite photos on wood. We love supporting the Chuck Jones Center for Creativity as they are masters at teaching both young and young of heart to nurture their creative genius. The Red Dot Auction is an amazing event and WoodSnap and our community are very proud to be a part of it," said Andy Brown, CEO of WoodSnap. In addition to the WoodSnap photographers, over 100 artists from around the globe have contributed one or more canvases and 3D art objects to this special fundraising event. What differentiates The Red Dot Auction from other silent art auctions is that the contributing artists have signed their artwork on the reverse of the work of art. Consequently, attendees at the event will not know who the artist is when bidding, they’ll only have their heart to follow. The Red Dot Auction will take place on Friday, May 11, from 7 to 10 PM at the Center located at South Coast Collection (SoCo), 3321 Hyland Avenue, Costa Mesa, California. In addition to the silent auction, there will also be a live auction featuring a collection of artwork by the “Dover Boys” –famed animators mentored by Chuck Jones, including Kelly Asbury (Shrek 2, Gnomeo and Juliet), Chris Bailey (Kim Possible, Hop), Jeff DeGrandis (Dora the Explorer, Wizard of Oz), and Rob Minkoff (The Lion King, Stuart Little). Admission is $25.00 per person ($35 per at the door) and open to the public. Buy tickets by May 1st and receive 5 free raffle tickets when you sign in at the front desk the evening of the event. To buy tickets online, go to ChuckJonesCenter.org/RedDot. Tickets include two Red Dots, which, if used, guarantee the bidder will pay $750 for that particular work of art. Cash bar, free appetizers by Casa del Lago. A special Preview Event will be held Friday, May 11, from 5:30 PM to 7 PM in advance of the Main Event and will include the opportunity to use your Red Dots before anyone else, view and place bids on the entire collection first, enjoy a musical performance by students of Music Vault Academy, be amazed by a Glitter-painting performance by James C. Mulligan, imbibe from an open bar, and savor hors d’oeuvres by 24 Carrots Events and Catering. Tickets for the Preview Event are $100 per person and are available at ChuckJonesCenter.org/RedDot. About the Chuck Jones Center for Creativity: The Chuck Jones Center for Creativity is a 501(c)3 public charity based in Orange County, CA. Chuck Jones was a creative genius who gave life to Road Runner, Wile E. Coyote & Bugs Bunny along with over 300 animated films. The Center, which he founded in 1999, is an organization that fosters and teaches creative thinking—the thinking behind problem solving. It’s a proven fact that “creativity” is like a muscle in your brain that needs exercise to get and stay healthy. The stronger that muscle is, the better it works in engaging tasks and solving problems. The Center serves as a gymnasium for the creative brain. They work with school systems without arts programs, people on the autism spectrum, the elderly (many of whom suffer from early onset dementia), and other groups, including corporate clients, who see the value of pumping up creativity in their ranks. About WoodSnap: Here at WoodSnap we have a passion for printing photos on wood. Through a specialized process, we take your photos and print them directly on premium baltic birch wood resulting in super vibrant colors, retaining high quality without sacrificing clarity. WoodSnap believes in planting trees & watering lives. We are more than just a company, we are a group of individuals that have chosen to make a difference. Newer PostRed Dot Auction VIII--Online Pre-bidding Opens 4/20! Older PostRed Dot Auction VIII--Tickets Now Available!